Few things in life are better than fresh basil. The leaves themselves are slightly bitter and oozing with juicy volatile goodness. Every season, we plant a few seedlings, clip them as if they were a bonsai and end the season with spindly plants that flower and achieve low yields of the leaves we tried so hard to foster. This season was quite different. Instead of this "depression era mentality" of saving it all for the end, I started harvesting leaves as soon as they were available. From anywhere and not caring about the plant's future. I wanted the basil and I wasn't going to let them go to seed. Interestingly, the more I tore off, the more they grew. In the beginning of the season (end of May, I started harvesting), I used scissors to get my fix. Then, as days got busier and dinner prep time grew shorter for one reason or another, I attacked the plant and just ripped off the leaves. And, they just kept growing - robustly. We now have 3 basil shrubs outside with more tasty leaves than we've ever had before. My friend Gary who's an extraordinary gardener, was amazed. He kept asking how carefully I harvested the leaves and I told him I just kind of attacked it. He was stunned. 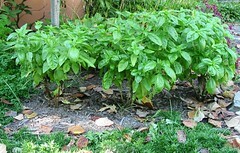 I am a total basil fanatic now and have grown a new appreciation of this robust herb. It'll kill me to see them wither on the first frost. But, next season, they're going in early and I'm tearing in quickly. Can't wait. That's how my mother taught me to grow basil, the more you touch it the more it grows! I would rip some off as I walked past the plant on the way to my car in the morning and munch on it as I drove to work. I live on the beach now, and basil doesn't do well in the salty, windy air and I miss it so! Wish I had known that years ago. The more good I thought I was doing by treating it like something delicate the worse it got. Know, I can't wait for next season. I'll have those plants to my waist. Hey Lorence, Good for you. I am so into basil now. It's the challenged gardner's dream. Pesto is trivial to freeze. And, because there's a good coating of olive oil over it, it doesn't easily get freezer burn. Can keep it a LONG time. Have fun with it and don't let it go to waste. Just reminded me... need to check my Basil! With this ridiculously warm Autumn, my garden has continued to produce well past its expiration date!